The technology capable of the highest solar photovoltaic conversion efficiencies demonstrated both in the lab and in the field use multi-junction solar cell structures containing multiple layers of different III-V semiconductors to absorb a broad range of ultraviolet to infrared light. For terrestrial systems, the high cost of high-efficiency multi-junction solar cells are overcome using optics to concentrate sunlight onto a device with a much smaller area, reducing the necessary semiconductor material and also increasing the energy conversion efficiency. These concentrator photovoltaic (CPV) systems are highly dependent on the incident solar spectrum and hence the geographical location. Since more equivalent hours of sunlight are harvestable at low latitudes, little data has been collected from CPV systems in climates typical at higher latitudes. A goal of this research is to quantify and analyze the performance of a high-efficiency CPV system in Ottawa and other parts of Canada, and to compare these results to other demonstrator systems around the world. This project includes the collection and analysis of local solar irradiation data (intensity and spectrum) and the mapping of this data to the output power of CPV demonstrator systems to determine the influence of changing insolation and weather conditions. Indoor testing via solar simulators (“artificial suns”) studies the influence of temperature and irradiance on the construction, packaging and efficiency of similar solar cells. Comparisons to the more common flash solar simulator yield a more comprehensive understanding of the predictive power of simulated illumination of solar cells. Read our white paper entitled “High-efficiency multi-junction solar cells: Current status and future potential” for an overview. How are solar cells tested? What types of monitoring and analysis are used for solar power systems? Read the white paper entitled “Testing the Technology: Necessary Capabilities for Measuring PV Performance” for an overview. The multi-junction approach can be adapted for the highly-efficient conversion of monochromatic photonic power to electrical power, and conversion efficiencies of >65% have been realized in devices by our industrial partner, Azastra Opto. For these photonic power converters (PPC), monolithic epitaxially-grown vertically-stacked GaAs pn junctions optimally harvest light near the current-balanced wavelength, realizing an output voltage proportional to a multiple of the photon voltage, while a corresponding current decrease reduces resistive losses. 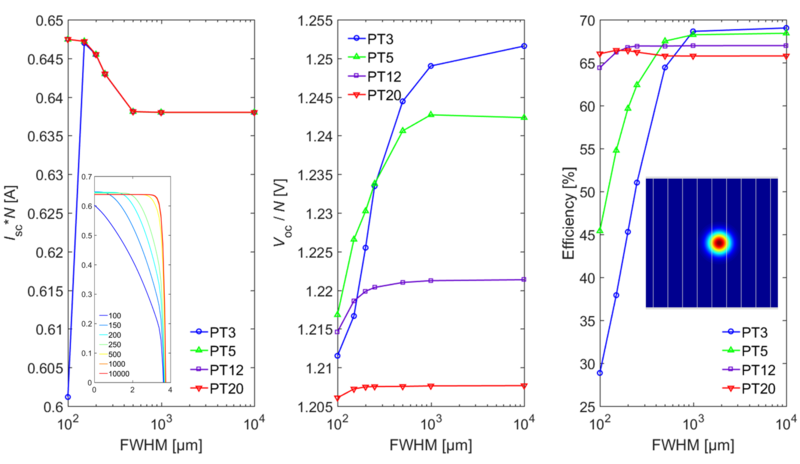 Instead of the 3-4 junctions in the most efficient solar cells, PPC with N = 5, 12, 20 junctions have been fabricated, directly outputting voltages of >5 V, >12 V, and nearly 24 V, respectively, with up to >65% optical-to-electrical conversion efficiency. These devices employ (N-1) tunnel junctions interconnecting the pn junctions, demonstrating that tunnel junctions need not be a limiting factor for future solar cells with >4 junctions. We have simulated N-junction PPC using a 3-dimensional distributed circuit model in SPICE as well as a full optoelectronic model in Synopsys Sentaurus. The latter model incorporates a custom-built luminescent coupling calculation which was vital to the matching of simulation with experiment. 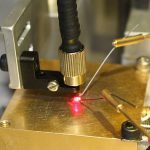 Coupling a PPC with a diode laser can be used to power a 650 V transistor gate driver requiring high galvanic isolation. In that case we measure a 20 dB reduction in EMI current conducted from the power circuit into the low-voltage control systems as compared to a baseline conventional transformer-based circuit with common-mode filters. Other applications include incorporation into high-efficiency power-over-fiber systems and biomedical applications such as the Bionic Eye. 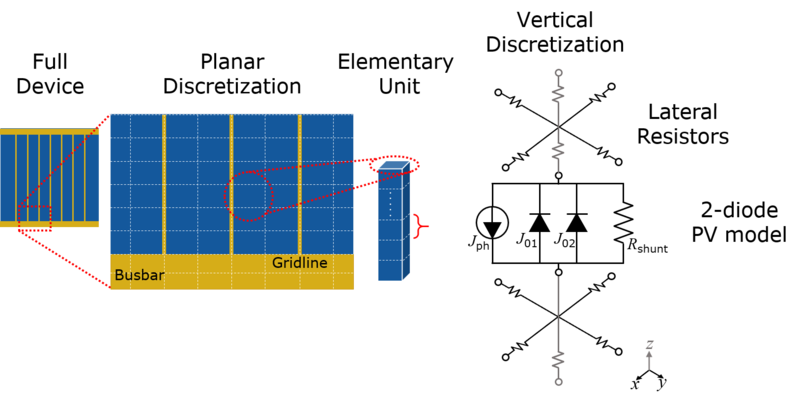 A single-junction (1J) photovoltaic (PV) solar cell can be modeled by a lumped equivalent circuit, consisting of a current source in parallel with two diodes and a shunt resistor, connected in-series with a second resistor. The current source represents the generation of charge carriers within the solar cell, the diodes represent the recombination current in the depletion region and space charge regions of the pn junction which forms the solar cell. The lumped 2-diode equivalent circuit model of a 1J solar cell is shown in the diagram below. 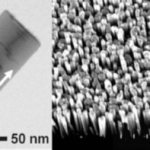 In multi-junction (MJ) PV devices, multiple absorbing pn junctions (subcells) are vertically stacked atop one another, interconnected via tunnel diodes. These types of devices include multi-junction solar cells and multi-junction photonic power converters (PPC). The lumped equivalent circuit for these devices consists of N number of 2-diode equivalent circuits, each connected in-series by resistors to represent the tunnel diodes while operating significantly below their peak tunneling currents. A more detailed circuit model can be constructed by three-dimensional discretization of the device and assigning an equivalent circuit to each discrete element. This approach is referred to as a distributed circuit model (DCM). We have developed a 3D DCM, shown in the figure below, that is capable of simulating the performance of a generalized MJ PV device under conditions of varied spectrum, non-uniform illumination, chromatic aberration, and cell fabrication. Using our distributed circuit model simulator (described above), the effect of non-uniform illumination on multi-junction photonic power converters (PPC) was studied with a variable number of junctions, N, of up to 20. The PPCs were simulated under illumination by a monochromatic beam of varying full widths at half-maximum (FWHM) beam sizes, which is a used as a measure of illumination non-uniformity. The short circuit current (Isc), open-circuit voltage (Voc) and cell efficiency are plotted below as a function of FWHM for devices with N = 3 to 20. Losses of greater than 30% were observed in some cases as the illumination was made progressively more non-uniform. Increasing the number of junctions was shown to mitigate the impact of non-uniform illumination substantially. Multi-junction solar cells are made of different semiconductor materials layered on top of each other with each layer optimized to absorb specific colors of light from the solar spectrum. In order for devices to perform efficiently, the layers must have the same spacing between atoms as the bottom material, called the substrate — a constraint that severely limits which materials can be used. This project aims to overcome this constraint and allow solar cell materials (or other semiconductor devices) that are traditionally grown on expensive substrates (such as gallium arsenide or indium phosphide) to be grown on inexpensive substrates without sacrificing material quality, an achievement that would significantly reduce the overall cost of these devices. We are investigating the properties of quasi-monocrystalline germanium, a material characterized by a distribution of spherical voids, to evaluate its potential for use as an interface layer between germanium and silicon. 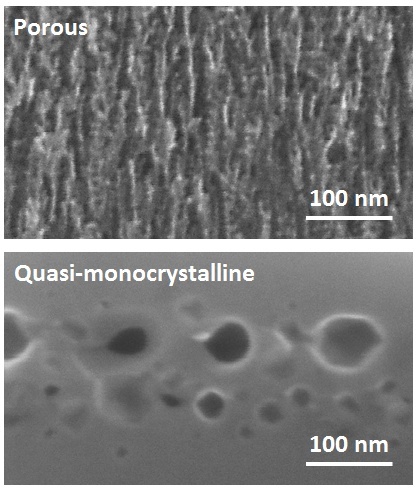 Quasi-monocrystalline germanium is synthesized by thermal annealing of porous germanium. 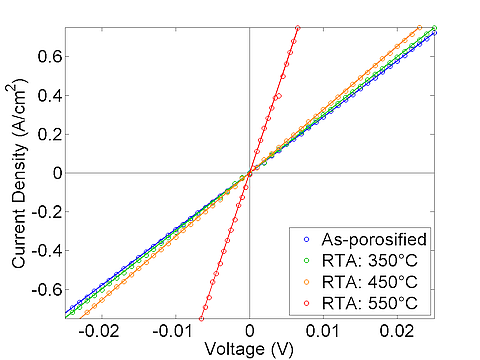 We have measured the electrical resistivity of porous germanium and shown that annealing significantly improves the conductivity of the material, demonstrating its potential for incorporation into electronic devices. Further characterization and computer simulations are underway. 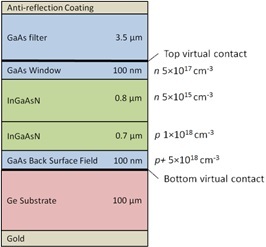 The InGaN/GaN material system demonstrates promising characteristics for photovoltaic applications including a tunable bandgap and a high absorption coefficient. Nanowires based on this material system have shown superior light absorption and growth possibilities with low-cost substrates, while mitigating the issue of lattice matching with bulk GaN. InGaN/GaN nanowires with quantum dots inside are grown by our collaborators from McGill University. The purpose of this research is to further our understanding of the InGaN/GaN material system as a candidate for high efficiency nanowire solar cells. 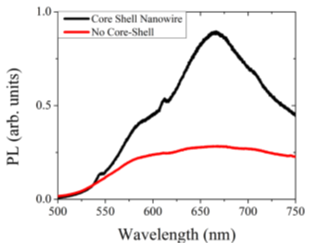 As an example we show here the enhanced photoluminescence from the core-shell nanowires as compared to nanowires without the AlGaN shell, indicating excellent material quality. A novel method for increasing the efficiency of multi-junction solar cells is by controlling the absorption properties of one or more sub-cells through the addition of quantum dots, as in the highly efficient solar cells of our industrial collaborators, Cyrium Technologies Inc. 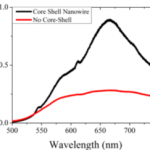 Such quantum dots have discrete absorption properties, dependent on their size. By carefully choosing the growth properties of the quantum dots, the quantum-dot-enhanced sub-cell can absorb wavelengths of light that would otherwise be absorbed elsewhere in a less efficient way, helping to balance the current from each sub-cell. This research project concentrates on the complete characterization of the effects of quantum dots inside a solar cell. 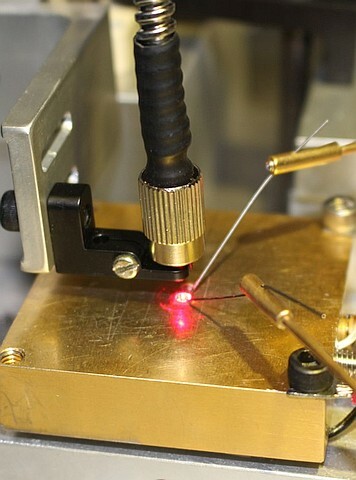 Various techniques, such as intensity-dependent photoluminescence of the quantum dots, temperature-dependent electrical measurements, and quantum efficiency probing will be used to fully understand the effects of these quantum confinement structures. Furthermore, probing the spectral response of a solar cell is a powerful technique allowing an insight in the physical mechanisms inside the material. Improvements in the generation of current, and hence device efficiency, are possible by the optimization of the quantum dots structure and the engineering of the energy levels in the multi-junction solar cell. Standard triple junction (Al)InGaP/InGaAs/Ge designs seem close to reaching their best efficiencies at around 40%. To further increase efficiencies and still keep costs low, novel 3- and 4-junction solar cells under concentration are of great interest of the concentrated photovoltaic (CPV) field. 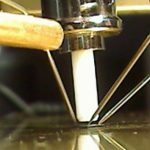 There is growing interest in using dilute nitride (i.e. InGaAsN) materials as one of the middle sub-cells in 4-5-and 6-junction devices, due to its tunable bandgap of around ~1eV. However due to short diffusion lengths, these materials require wide-depletion junctions. 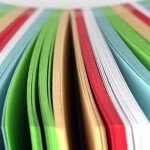 Careful design is needed to achieve good performance and to minimize sensitivity to material quality. At the same time the luminescent coupling (re-absorption of the photons emitted due to radiative recombination) is known to greatly affect the performance of the multi-junction solar cells by providing an increase in the open-circuit voltage of the III-V sub-cells, and an enhancement in short-circuit current due to coupling from the front and back surface fields of the sub-cells into the absorber layers. 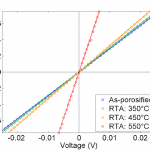 We proposed a 4-junction Ga0.5In0.5P/Al0.05Ga0.95As/InGaAsN/Ge solar cell design with a 0.96 eV dilute nitride sub-cell. The cell is modeled in the commercial drift-diffusion based software TCAD Sentaurus. This project is focused on optimization of the cell designs in terms of the sub-cell band gaps and thicknesses and with incorporation of the luminescent coupling effects in device models that allows for efficient modelling and optimization of complex, multi-layered structures. 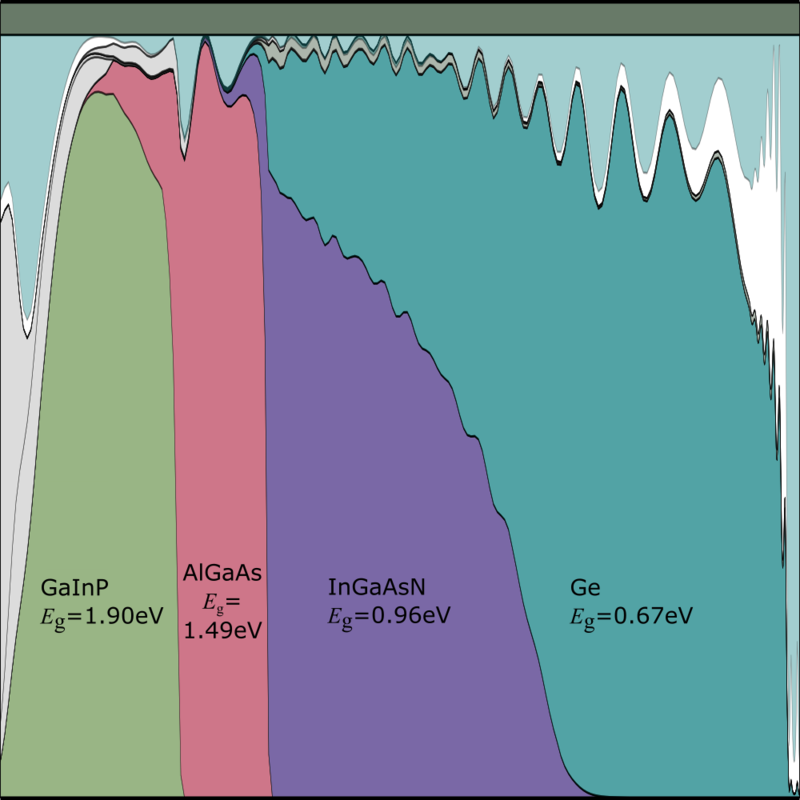 An example of state-of-the-art triple-junction solar cells is the lattice matched GaInP/Ga(In)As/Ge solar cell achieving efficiencies greater than 40% under concentrated illumination despite significant photo-current overproduction by the low-bandgap Ge sub-cell. More ideal current matching could be achieved by replacing the Ge sub-cell with a sub-cell composed of a semiconductor material having a 1 eV bandgap. Unfortunately often it is impossible to find semiconductor material with desired (1eV) bangap, that has the same lattice constant as the semiconductors building top and middle sub-cell. To maximize crystalline material quality in the lattice mismatched sub-cell, it is desirable to design a compositionally graded buffer (CGB) to lattice match middle and bottom sub-cells. However even in the presence of the CGB the formation of the threading dislocation due to the lattice mismatch induced strain is present. For that reasons, such a device requires an inverted growth such that the formation of threading dislocations is confined within the CGB region, away from the active regions of the middle and top sub-cells. The most commonly suggested material to use in the bottom sub-cell is the ternary alloy Ga0.7In0.3As. We suggest to use CuInSe2 as a bottom sub-cell since it has much higher absorption coefficient than Ga0.7In0.3As what allows for use of 4 times lower thickness of this material to absorb the same amount of light as Ga0.7In0.3As. We investigated numerically the performance of the two triple-junction cell designs with Ga0.7In0.3As as well as CuInSe2 as a bottom sub-cell under low and high concentration. Their performance was analyzed as a function of the density of threading dislocations, as well as the composition of the compositionally graded buffer. The maximum theoretical efficiency for a single junction solar cell as dictated by the Shockley – Queisser detailed balance calculations under the standard AM1.5G spectrum is 33%. This is limited by sub-bandgap losses, thermalization of carriers with energies greater than the semiconductor bandgap, and radiative recombination losses. For commercial grade silicon solar cells, efficiencies are normally limited by non-radiative recombination losses, which yield overall efficiencies closer to 15-18%. Surface recombination is an example of a non-radiative recombination process that occurs across the interface between different material layers due to the presence of a sufficiently high density of trap states. This can be an important loss mechanism for poorly passivated solar cells, which leads to a significant roll-off in the spectral response at high photon energies. The method of reducing these losses by modifying the illumination spectra incident on the cell is called spectral conversion. Down-conversion (DC) is an optical process whereby one high-energy photon is converted into two lower-energy photons, as shown in figure (a) below, yielding reduced thermalization and surface recombination losses. A theoretical maximum efficiency of 38.6% is achievable using a down-converter with a 2.2-eV bandgap covering the front surface of a solar cell with a 1.1-eV bandgap. Down-shifting (DS) is a similar optical process whereby one high-energy photon is converted into a single lower-energy photon, as shown in figure (b) below, yielding reduced surface recombination losses only. This is effective where the photons are shifted into a region of the solar cell with higher spectral response. 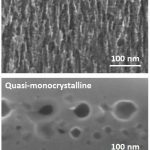 We have investigated the effects of the down shifting layers made of silicon nanocrystals embedded in fused silica and coupled to silicon solar cells. Up-conversion (UC), on the other hand, is a process whereby multiple low-energy sub-bandgap photons are converted to higher energy photons that can be absorbed by the solar cell, as shown in figure (c) below. The UC layers are coupled to the back surface of bifacial solar cells, and their presence cannot decrease the efficiency of the cell as is possible in the case of poor choice of the down-shifting layers. Detailed balance calculations show that the maximum efficiency of silicon solar cells can increase to 40.2% when coupled to a UC layer.